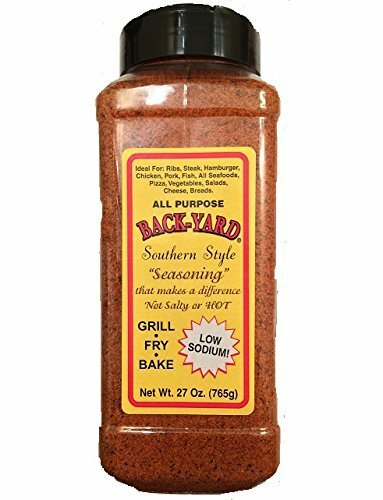 Backyard Southern Style all-purpose seasoning is the ultimate combination of herbs and spices that bring out the best flavors in any food. Use this healthy seasoning generously and guilt-free with any low sodium diet. Add to poultry, steak, ribs, fish, pork, vegetables, salads, potatoes, french fries, eggs, grits, popcorn and whatever else your hungry heart desires. Your family, friends and taste buds will thank you, and you'll realize how bland life was before you found Backyard All Purpose Seasoning. This southern secret is one of the top selling seasonings in the country. No more measuring, mixing and messes. Create flavorful dishes in a flash with a dash of Backyard Southern Style. No more measuring, mixing and messes. Create flavorful dishes in a flash with a dash of Backyard Southern Style. Instantly turn your kitchen into a 5-star restaurant bursting with one-of-a-kind flavor. Enhance any food cooked any way you want - baking, grilling, frying, smoking, broiling, raw, or in sauces, rubs and marinades, the uses and flavorful bliss are endless. This Low sodium healthy seasoning is a great alternative for salt. If you have any questions about this product by Backyard Southern Style, contact us by completing and submitting the form below. If you are looking for a specif part number, please include it with your message.